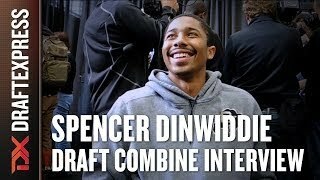 After going into the season ranked as the 2nd best returning NBA prospect in the Pac-12 and excelling in an expanded role as Colorado's primary ball-handler, Spencer Dinwiddie tore his ACLjust five games into Pac-12 Conference play, prematurely ending what was supposed to be a marquee year for him and the Buffaloes. Still, he looked good in the 17 games that he did play, averaging a cool 16.6 points and 4.6 assists against the likes of #6 Kansas, #7 Oklahoma State, #10 Oregon, #25 Baylor, and Harvard, while doing well in a match up with likely top-10 pick Marcus Smart. After declaring for the NBA Draft, scouts will have to scrutinize the footage that exists from this season, as well as the results of any medical examinations that can be conducted on his knee, while speculating about the effects of Dinwiddie's injury in order to evaluate his prospects at the next level. Dinwiddie has outstanding size for a guard, standing 6'6 with good length and an improving, albeit wiry, 200-pound frame. As we have written before, he is not the most explosive athlete, but he shows the quickness, first step, and body control to suggest that he can play a variety of positions and roles at the next level. Teams will have to do their due diligence tracking his recovery, however, to see how he is able to bounce back both physically and athletically from injury. Offensively, Dinwiddie's role and production remained relatively constant from his sophomore season, and he averaged 18.6 points per 40 minutes pace adjusted despite seeing his usage rate decrease (24% to 21%) on as a junior. He emerged as a far more efficient scorer as a junior to the tune of 52% 2P% and 41% 3P% while netting a career 68% True Shooting Percentage, which ranked second best among all prospects in our Top-100. Part of that could be attributed to sample size, as Dinwiddie missed the majority of in-conference action, where players tend to struggle the most against better competition and advance scouting. 10 of the 17 opponents Dinwiddie faced ranked outside of the KenPom Top-100, and Dinwiddie's 2-point percentage plummeted to 45% in the seven games he played against Top-100 competition, after shooting 57% against the other 10 (average ranking: 193). The two areas where Dinwiddie improved most as a scorer were as a finisher in transition and as a perimeter shooter. On film, Dinwiddie continued to excel at pushing the ball in transition and he improved his shooting percentage in these situations by over 10%, making 53.3% of his attempts in transition and 56% of his overall attempts around the basket. His body control stood out at the collegiate level as he did an excellent job of using his size and footwork to his advantage, particularly in terms of shielding the ball, seeing over defenders, and nimbly moving through traffic in the lane. Dinwiddie got stronger between his sophomore and junior seasons, and that helped him do a better job of dealing with contact and finishing around the rim, something that has been an issue for him most of his career. He did a good job of getting to the basket in half court settings for much of the same reasons, also showing that same smooth first step, ability to change speeds, and knack for attacking opposing defenders right at the moment they are on their heels. He did a good job of getting to the basket in just about any situation and it's worth noting that he handled the ball almost exclusively for Colorado at the end of the shot clock. He is not a particularly advanced shot creator, particularly with his left hand, but he's extremely smooth and creative and does a terrific job of initiating contact and getting to the free throw line. His 8.9 free throw attempts per 40 minutes pace adjusted ranked fifth, among prospects in our top-100, and that's certainly not a fluke considering he got there at the same exact rate last season. Additionally, he looked far more comfortable operating out of the pick-and-roll as a junior. His ability to shoot, distribute, or attack his man off of the dribble made him particularly difficult to guard out of the pick-and-roll and his willingness to attack the basket and draw contact is encouraging given his reputation for lacking toughness and aggressiveness. What makes Dinwiddie interesting is that he can not only create his own shot effectively, but he's also an excellent shooter. He attempted 4.7 three-point field goal attempts per 40 minutes pace adjusted and made an impressive 41.3% of his attempts. This was an important development as his 3-point percentage really fell off his sophomore season (34%) after a blistering freshman year (45%). On film, his shooting mechanics, particularly in his upper body, look solid, but he tends to fall forward or drift to the side if he does not have enough time to set his feet and square up to the basket. He is a good shot creator from beyond the arc, however, and his ability to anticipate pressure while creating (relatively) open looks for himself is intriguing looking forward to the next level. So, too, is his improvement as a distributor. He posted a career high 4.8 assists per 40 minutes pace adjusted against a career low 2.2 turnovers while playing even greater stretches on the ball for Colorado. Furthermore, his 2.18 assist to turnover ratio ranked sixth among all prospects in our top-100. He was particularly effective in pick-and-roll situations, showing burgeoning chemistry with his big men in addition to his intriguing versatility as a scorer. With that said, and despite what the numbers suggest, Dinwiddie is still not the greatest passer in the world, as he's prone to excessive dribbling and can still improve his ability to read the floor and find teammates. His decision making is questionable at times, and it's not yet clear whether he'll be able to run an NBA team's offense full time, even if his size, versatility, and significant improvement between his sophomore and junior years suggest that he has the potential to continue to develop at the next level. Dinwiddie shows significant promise as an offensive player, but his defensive prospects are murkier. On the one hand, he shows well above average lateral quickness and his 1.9 steals per 40 minutes pace adjusted position him in the top-15 of prospects in our top-100. Additionally, his size and solid fundamentals suggest that he could, at the very least, be an average defender at the next level. On the other hand, his intensity level wavers quite a bit here, and there are question marks about whether he's quick enough to stay in front of NBA point guards. Furthermore, he often struggles fighting through screens, so continuing to get tougher, stronger and more aggressive here will be necessary going up against NBA guards. Based on the tape, Dinwiddie looked as though he was on his way to a stellar junior season with Colorado before his injury. In fact, he was showing improvement in a variety of different areas and was playing the most efficient basketball of his career as the primary ball handler on a 14-2 team ranked in the AP Top-25, making us wonder just where he might be projected to be drafted had he not gotten hurt (he was ranked in our first round prior to that). While a torn ACL is no longer as detrimental of an injury as it once was, scouts will be monitoring his rehabilitation closely to see just how much he will be affected physically and athletically by his injury. Not every ACL is the same, so NBA team doctors will have to weigh in with their assessment of how his knee heals and the timetable for him making a full recovery. Dinwiddie's versatility should allow him to contribute in a variety of ways, however, even if he is unable to initially regain all of his athleticism immediately. Some NBA teams might be wondering at the moment whether Dinwiddie is a better prospect than he's being given credit for; as 6'6 guards who can create, shoot, and distribute are not that common in the NBA. At the same time, not every team will have the patience to wait on him, while there is always the chance of recurring issues. Thus, it remains to be seen where front offices will be willing to gamble on Dinwiddie on draft night. Should he fall into the depths of the second round, however, it's a legit possibility that he could end up being a steal for the right team in a very deep draft, even if it might take until the 2015-2016 season for that pick to bear fruit. After a promising freshman season where he made solid contributions for Pac 12 tournament champions Colorado, Spencer Dinwiddie has taken his game to the next level as a sophomore, increasing his scoring and assists considerably without a great increase in minutes, while also seeing his field-goal percentage rise. Standing 6-6 with decent length and a below average frame and build, Dinwiddie is a good athlete overall, possessing a fast first step and very good quickness. He isn't the most explosive vertical athlete, however, being a decidedly below-the-rim player in the half court. On the offensive end, Dinwiddie is capable of scoring the ball from all over the floor, and he creates most of his attempts on his own out of pick-and-roll or isolation situations. Possessing very good ball-handling skills with both hands, good control, and a solid arsenal of crafty moves along with the wherewithal to use them, Dinwiddie often has no problem breaking his man down off the dribble to get where he wants to go. Dinwiddie's weapon of choice is most often a pull-up jumper, as he relies heavily on his shot-making ability from the perimeter to contribute offensively. He possesses very strong mechanics with a high and quick release, and is especially impressive with his ability to hit shots on the move, doing a good job stepping into his shots and maintaining balance. Dinwiddie is equally dangerous spotting up for threes, showing range to the NBA three-point line, though he tends to settle for excessively long three-pointers too often and his mechanics are prone to breaking down when he's closely contested on spot-ups. The mid-range is where Dinwiddie appears most comfortable, as he uses a variety of pull-up jumpers, floaters, and runners to get the job done, all of which he shows little struggles getting separation for. He actually may rely on these skills a bit too much, as he doesn't frequently take the ball all the way to the basket, and isn't a great finisher when he does, especially when dealing with weak side help or having to score through contact. Dinwiddie only converted 38% of his 2-point attempts as a freshman in large part due to his struggles around the basket, and while he started off the season looking much improved in that area, he's fallen off a bit in conference action. To his credit, he does do an excellent job or drawing contact and getting to the free-throw line when he does take the ball to the basket, and also draws a good number of fouls on the perimeter by getting defenders to bite on his shot attempts, but still could stand to become a better finisher at the rim to round out his scoring game, as its unlikely that he'll be able to draw fouls at quite the same rate in the pros. Dinwiddie serves as one of the primary ball-handlers in Colorado's attack, often splitting the duties with teammate Askia Booker. Dinwiddie is usually the one to bring the ball up the floor and does a good share of initiating the team's offense, but doesn't serve the role of traditional point guard, not often creating for others. He shows good vision and passing ability in transition, operating pick-and-rolls, and making post-entry passes, but doesn't appear to be a true point guard by any stretch, mostly using his ball-handling responsibilities to create his own offense. On the negative side, Dinwiddie shows some problems with turning the ball over, which is somewhat expected given how often he creates his own shot, though he also can struggle with inconsistency, having already three games this year with five or less points. On the defensive end, Dinwiddie shows solid fundamentals and effort level, along with enough lateral quickness to stay in front of pretty much everyone he's matched up against, but can be prone to just go through the motions at times, not always closing out and contesting as hard as he could. Looking forward, Dinwiddie is still only 19 years old and coming into his own on a well-balanced team, though he shows a nice foundation of skills already, along with good physical tools for a shooting guard or combo guard. Filling out his frame and maximizing his strength could help him on both ends of the floor, while becoming a better finisher at the basket and a higher level defender should be his priorities from a skills perspective. It's still early to make any concrete projections down the road, especially given how much he's improved in the past year, but Dinwiddie is certainly someone to keep an eye on.